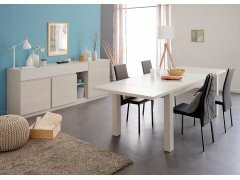 RoomSmart’s Gabin Collection is a light, airy neutral ash woodgrain furniture that is streamlined and so versatile for storage and organizational possibilities! The simple lines of each piece, without drawer pulls or handles, is restful and looks so natural! This collection is eclectic for most home décor styles, and can be paired with any color scheme. Little details, like offset shelves amid cabinet doors, an inset glass shelf for displaying your favorite collectibles, and drawers for tucking away what you don’t want to display are featured in each piece. The collection is available in Nelson Ash woodgrain foil finish veneer, over top-grade particleboard core, built to last, and for long-lasting beauty! Matching pieces can be used in homes with open kitchen, dining, living areas, creating a warm, welcoming living space that you will love! ARTISTIC CABINET DESIGN: Interesting design combining glass shelves, open shelves and closed cabinet with offset placement gives you a cabinet that is eye-catching and versatile.GLASS DISPLAY SHELVES: Here’s the perfect spot for your collectibles, wine glasses, or heirloom china, or even your..
ECLECTIC CONTEMPORARY STYLE: Light, neutral color and timeless lines allow you to pair this dining table with most home décor styles and color schemes.DURABLE CONSTRUCTION: Manufactured from top-grade particleboard with heavy-duty stainless steel hardware, so your table is sturdy and long-las..